Paiute sculpin (lateral view) from Sagehen Creek, CA in 2012. Photo by Matt Young. Paiute sculpin (frontal view) from Sagehen Creek, CA in 2012. Photo by Matt Young. 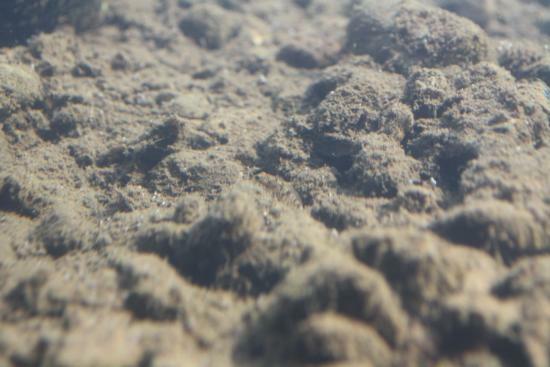 Paiute sculpin in Sagehen Creek, CA in 2012. Photo by Matt Young. See photo below for the location of this highly camouflaged fish. Paiute sculpin in Sagehen Creek, CA in 2012. Photo by Matt Young. Paiute Sculpins favor living on rubble or gravel in cold, moderate-gradient streams where water temperatures rarely exceed 20°C. They are also found living in lakes and surviving sustained temperatures in the range of 20-25°C where water flow is ample. Because Paiute Sculpins typically live in the riffles of clear streams they are often found in association with trout. In Lake Tahoe Paiute Sculpin are most often found in deepwater near aquatic macrophytes. In both stream and lake environments the sculpins feed primarily at night when they can more easily ambush and capture prey. Their diet in a stream may consist of aquatic insect larvae, aquatic beetles, snails, water mites, or algae. Dragonfly larvae are a focal point of feeding in meadow streams. Feeding in Lake Tahoe varies with the depth of the sculpin. Deep water dwellers feed on mostly detritus and algae, with other prey items supplementing their diet. Paiute Sculpins in shallower regions eat primarily benthic organisms such as chironomid midge larvae. The feeding habits of Paiute Sculpins vary with body size and seasonal changes, as certain prey are more available during specific time periods. They feed year-round with decreased consumption rates in fall and winter. 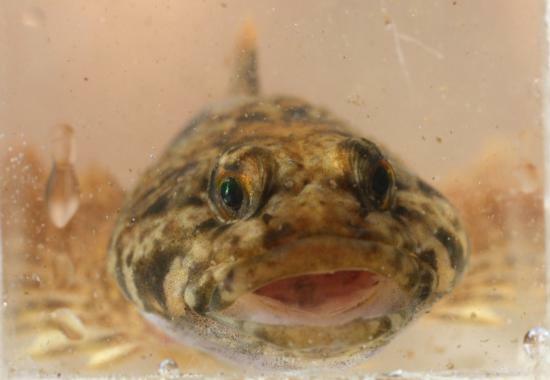 Paiute Sculpin reach sexual maturity in their 2nd or 3rd year, with spawning occurring primarily in May and June. Spawning sites are usually found where there is adequate rocky or gravelly substrate to hide nests. Presumably each female deposits her eggs in one nest to be fertilized. One study revealed mean fecundity in Lake Tahoe was 123 eggs per female, similar to egg production in Sagehen Creek, CA. When the fry hatch they remain within the nest for another 1-2 weeks, absorbing the yolk sac. The post-larval sculpins may then be washed away by downstream currents or littoral waves sometime in the following weeks. The success of Paiute Sculpin has great variance and populations seem to thrive in the absence of winter flooding, though overall stream conditions may suffer.